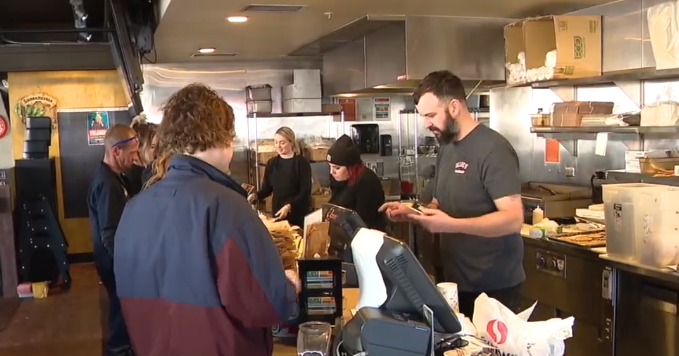 Nevada lawmakers are taking up an issue that could impact the state's workforce as an assembly bill up for debate is looking at raising the minimum wage. LAS VEGAS (KTNV) — Nevada lawmakers are taking up an issue that could impact the state's workforce as an assembly bill up for debate is looking at raising the minimum wage. Workers with health benefits who currently make $7.25 an hour would increase 75 cents every year until it hits $11 an hour, according to the proposed bill. While workers without benefits who currently make $8.25 an hour would have their rates also go up by 75 cents per year until they hit $12 an hour. Brandon Martin, a worker in Nevada, says he deserves a say in the minimum wage debate, as his paycheck is at stake. Martin said he is the sole provider for his wife and children and does it making $9 an hour. "Some days I wake up, and I don't know how I am going to make it through," Martin said. "As I go through the month, I try to stop by the local food pantry, it's right down the street from my apartment," Martin said, "I walk there, go grab what I can and make it work." He told 13 Action News he hopes people in power will listen, but in the meantime, his faith is getting him through. "I know my day is coming, you know and I'm just going to be patient and wait for that day to come," Martin said. The last time Nevadans' saw an increase in wage was back in 2011. Also, workers at the hearing said rent continues to increase in Las Vegas, so why aren't their wages? Jim Rees, co-owner of Hash House of a Go-Go, said before the legislature makes any changes, Tip Credit needs to be understood. Tip Credit is when an employer can pay workers below minimum wage as long as their tips bring them back to that level. Rees said Nevada is one of seven states that does not allow that. "That is what creates a huge issue for a full-service restaurant in Nevada,' he said. Mimmo Ferraro, the owner of Pizza Forte, has found a way to pay more than the minimum, but that's only because he does not have an extensive amount of staff. "Everybody is making $12 an hour, you know but I don't have 75 employees," Ferraro said. Ferraro also said his second business, however, would take a hit. He said giving it across the board to bartenders or servers would eventually mean he'd have to raise prices on his menu. Should Assembly Bill 456 pass, the first increase in the minimum wage will go up in January 2020.